­Why Vanishing Ice Is Likely All Natural? If we are to truly prepare for the dangers of climate change and build more resilient environments, we must first understand natural climate change. Unfortunately due to the narrow focus on rising CO2, the public remains ill-informed and fearful about the causes retreating ice. Africa’s Mount Kilimanjaro and America’s Glacier National Park are 2 iconic examples of failed climate interpretations. For example, Al Gore’s “Inconvenient Truth” suggested warmth from rising CO2 had been melting Kilmanjaro’s glaciers. In truth, instrumental data revealed local temperatures have never risen above the freezing point. In 2004, Dr. Geoff Jenkins, Head of the Climate Prediction Programme at England’s Hadley Centre, was prompted by the evidence of no warming, to email the IPCC’s Phil Jones and ask and I quote “would you agree that there is no convincing evidence for Kilimanjaro glacier melt being due to recent warming (let alone man-made warming)?” Yet due to the politicization of climate science, Al Gore shared the Nobel Prize despite perpetuating the global warming myth of Kilimanjaro. 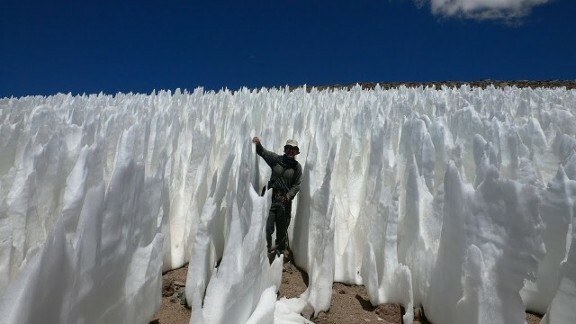 Ice structures such as these penitentes, are commonly seen in many high elevation glaciers, and help scientists determine if retreating ice was caused by below freezing sublimation, or melting from warmer air. Over decades, sublimation creates sharp features at the border between sunlight and shade. In contrast, any melting from warm air temperatures oozes across the icy surface destroying those sharp features in a matter of days. 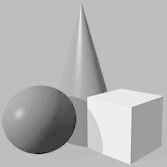 So the presence of sharp-angled features like these penitentes, are excellent long term indicators of dry and below freezing temperatures. This ice core data from Greenland, exemplifies the Holocene’s changing temperature patterns common for most of the Arctic. But it is a pattern that also corresponds to climate change in many other regions across the globe. After the last Ice Age ended, the period of warmer temperatures between 9,000 and 4,000 years ago has been dubbed the Holocene Optimum. During that time, remnant glaciers from the Ice Age retreated and shrank to sizes far smaller than we witness today. All of Norway’s glaciers completely disappeared at least once,11,39 and Greenland’s greatest glaciers, like the Jakobshavn, remained much further inland than now observed.29 Like many northern glaciers, Jakobshavn had only recently advanced past its present terminus during the unprecedented cold of the Little Ice Age. Changes in insolation due to the sun’s orbital cycles, or Milankovitch cycles, correspond with the recent 100,000-year cycles of past major ice ages. We are currently in another warm peak. The Milankovitch orbital cycles also predicted the current cooling trend that began about 4000 years ago. 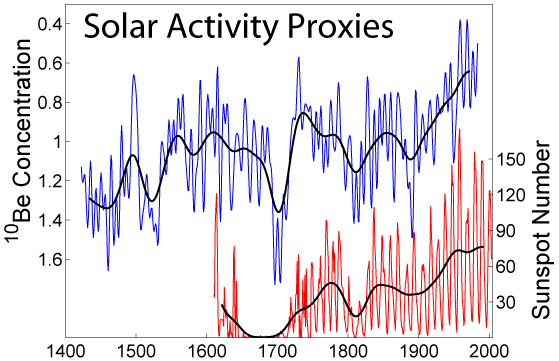 However warm spikes due to high solar output punctuated this cooling trend roughly every thousand years.22 The unprecedented Holocene glacier growth during the Little Ice Age occurred when solar output was extremely low. 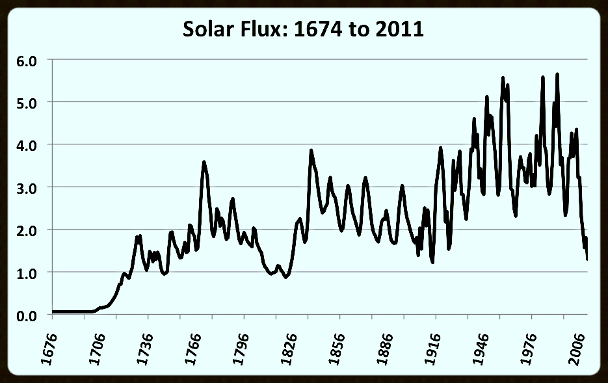 In this graph depicting 300+ years of solar flux, the earth warmed as we ascended from the Little Ice Age. Our recent warm spike coincides with high solar flux. However, recently solar output has again retreated, approaching Little Ice Age levels, and correlates with the increasing frequency of cold winters. The next two decades will allows us to evaluate more accurately the effect of these solar changes on climate and glaciers. The correlation between Greenland ice core data and solar flux, is also seen in Scandinavian tree ring data.15 Tree rings suggest the warmest decade in the past 2000 years, happened during the warm spike of the Roman Warm Period between 27 and 56 AD. After a period of resumed cooling a new warm spike occurred 1000 years ago during the Medieval Warm Period. After more extreme cooling during the Little Ice Age, a third warm spike peaked around the 1940s. Most interesting, the consensus from multiple tree ring data sets around the world, also suggest natural habitats were warmer during the 1940s than they are now. 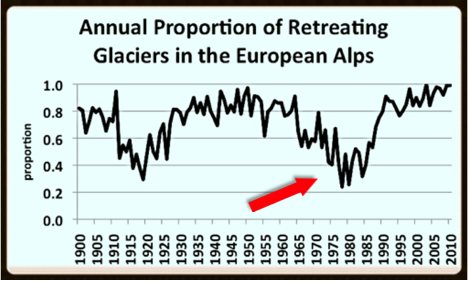 Likewise, the greatest rates of retreat for glaciers from Glacier National Park to the European Alps also happened during the 1940s. However during the warmth of the Bronze Age 3000 years ago, the glacier was Much smaller than today. During the cooler Iron Age the glacier began to grow, but rapidly retreated during the warm spike of the Roman Warm Period. 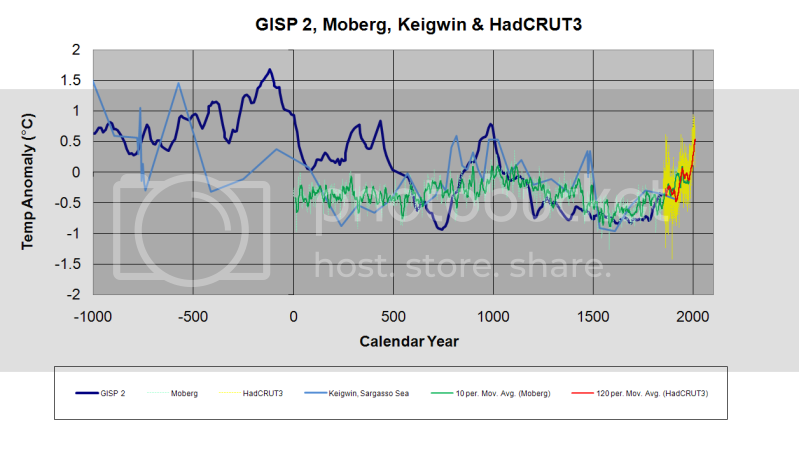 The glacier advanced again almost reaching its Little Ice Age maximum, but retreated rapidly during the warm spike during the Medieval Warm Period. During the Little Ice Age, the Great Aletsch advanced to its greatest length of the Holocene, in rhythm with a series of 4 documented solar minimums. Each advance was followed by a rapid retreat, similar to what we observe today, when solar flux increased. The glaciers recent retreat does not appear any different from retreats in past. So what does that tell us? 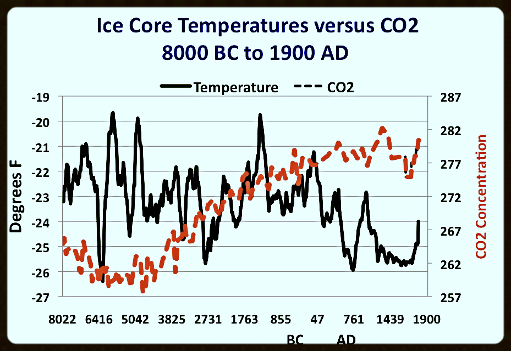 To be clear the skeptic argument is not “because it was natural before then CO2 can not possibly contribute today”. Furthermore when solar flux dipped between the 1960s and 80s, a high proportion of Alpine glaciers, as well as glaciers around the world, stopped retreating and many began to advance as seen here in the Alps. Changes in solar insolation affect oceans in two critical ways. During high solar output of the Medieval Warm Period, tropical waters in both the Atlantic13 and Pacific14 increased by as much as 1°C warmer than today. During the solar minimums of the Little Ice Age, tropical oceans dropped by as much as 1°C degree cooler than today. But equally important changes in insolation affected the volume of warmer tropical waters that were transported toward the poles. 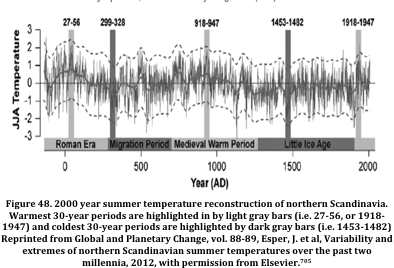 Multiple lines of evidence correlate higher solar activity during the Roman and Medieval Warm Periods, with an increased flow of warm Atlantic water into the Arctic,16 resulting in reduced sea ice. Conversely, during low solar activity during the Little Ice Age, transport of warm water was reduced by 10% and Arctic sea ice increased.17 Although it is not a situation I would ever hope for, if history repeats itself, then natural climate dynamics of the past suggest, the current drop in the sun’s output will produce a similar cooler climate, and it will likely be detected first as a slow down in the poleward transport of ocean heat.22 Should we prepare for this possibility? Water heated in the tropics is saltier and denser, and when transported into the Arctic lurks 100 to 900 meters below the surface.45 That warm subsurface water can melt sea ice and undermine grounding points of submerged glaciers causing an acceleration of ice discharge. Intruding warm deep water also melts the underside of floating ice shelves, which also accelerates calving and ice discharge. When warm water intrusions subsided, the glacier stabilized, and even began advancing between 1985–2002. Although the recent retreat of Greenland’s glaciers is reported as an acceleration relative to the 70s, the rate of retreat is now much slower than the 30s and 40s. And again the 20th century pattern of retreat does not correlate with rising CO2 concentrations. Coinciding with cycles of reduced sea ice, glaciers on the island Novaya Zemlya in the Barents Sea, also underwent their greatest retreat around 1920 to 1940.61 After several decades of stability, its tidewater glaciers began retreating again around the year 2000, but at a rate five times slower than the 1930s.47 The recent cycle of intruding warm Atlantic water45 is now waning and if solar flux remains low, we should expect Arctic sea ice in the Barents and Kara seas to begin a recovery and Arctic glaciers to stabilize within the next 15 years. The contrasting behavior of Antarctic Ice is further confirmation that intruding warm water is a natural driver of melting polar ice. Unlike ice that melted deep inside the Arctic Circle, Antarctic Sea Ice has increased to record extent and expands far outside the Antarctic Circle. Why such polar opposites? Because Antarctica is shielded from intruding warm waters by a Circumpolar Current. Maps pinpointing regions with the greatest basal melt,48 highlighted here by red dots, coincide with the greatest loss of glacier ice along the Amundsen Sea hot spot. Amundsen glaciers are grounded along the coastal shelf where ancient channels can direct warm, upwelled deep water directly to the base of the glaciers. Early explorers reported excessive crevasses and concave surfaces on these glaciers suggesting extreme basal melting was happening in 1950s, and was likely a process that has been ongoing on for millennia.38 Much like Greenland’s Jakobshavn glacier, once Amundsen’s glaciers retreated from their Highest ridge on the continental shelves, upwelled warm water could overflow the ridge and melt an increasingly larger cavity near the glaciers grounding points. In turn, a larger cavity allows even more warm water to enter. In contrast, the few Amundsen Sea glaciers with grounding points located beyond the reach of upwelled waters, those glaciers have not lost any ice. Like the rhythm of retreating and advancing glaciers, rates of sea level rise have ebbed and flowed as seen in this graph from the IPCC. Again it is the 30s and 40s that experienced both the greatest retreat of glaciers and the fastest rise in global sea level. With the recent decline in solar flux and the shift to cool phases of ocean oscillations, natural climate change suggests that although glacier retreat and sea level rise will likely continue over the next few decades, the rates of sea level rise and glacier retreats will slow down.The next decade will provide the natural experiment to test the validity of competing hypotheses. Are changes in the earth’s ice driven by natural or CO2 driven climate change. I am betting on natural climate change. Read more about natural climate change In Landscapes and Cycles: An Environmentalist’s Journey to Climate Skeptisicsm! 7. Kaser, G., et al. (2012) Is the decline of ice on Kilimanjaro unprecedented in the Holocene? The Holocene, doi:10.1177/0959683610369498. 11. Young, N., et al., (2011) Response of Jakobshavn Isbræ, Greenland, to Holocene climate Change. Geology, vol. 39, p. 131?134. 12. Nesje, A., et al. (2007) Norwegian mountain glaciers in the past, present and future. Global and Planetary Change, vol. 60, p. 10–27. 15. Esper, J. et al. (2012) Variability and extremes of northern Scandinavian summer temperatures over the past two millennia. Global and Planetary Change 88–89 (2012) 1–9. 17. 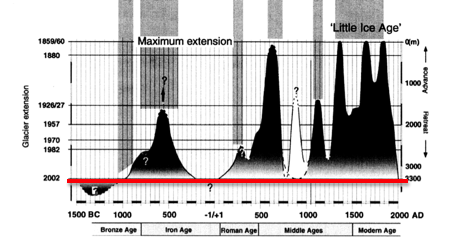 Lund, D. (2006) Gulf Stream density structure and transport during the past millennium. Nature, vol. 444. 19. Pederson,G., et al., (2006) Long-Duration Drought Variability and Impacts on Ecosystem Services: A Case Study from Glacier National Park, Montana. . Earth Interactions, vol. 10, p.1?28. 20. Long. W. (1953) Recession of Easton and Deming Glacier. The Scientific Monthly, Vol. 76, pp. 241-247. 22. Broecker, W.S., Denton, G.H., 2008. Wobbly ocean conveyor circulation during the Holocene? Quaternary Science Reviews 27, 1939–1950. 23. 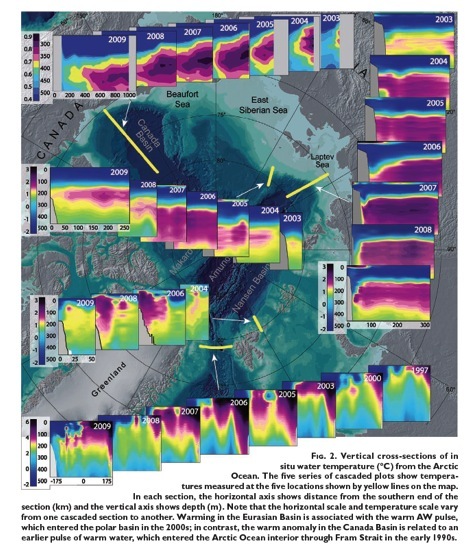 Howat, I., and Eddy, A., (2011) Multi-decadal retreat of Greenland’s marine-terminating glaciers. Journal of Glaciology, Vol. 57, p. 38?396. 27. Mudie, P. (2005) Decadal-scale sea ice changes in the Canadian Arctic and their impacts on humans during the past 4,000 years. Environmental Archaeology, vol. 10, p. 113-126. 28. Nesje, A., and Dahl, S. (2003) The ‘Little Ice Age’ – only temperature? The Holocene, vol. 13, p. 139?145. 29. Nesje, A., et al. (2007) Norwegian mountain glaciers in the past, present and future. Global and Planetary Change, vol. 60, p. 10–27. 30. Young, N., et al., (2011) Response of Jakobshavn Isbræ, Greenland, to Holocene climate Change. Geology, vol. 39, p. 131?134. 31. Csatho, B., et al., (2008) Intermittent thinning of Jakobshavn Isbræ, West Greenland, since the Little Ice Age. Journal of Glaciology, vol. 54, p. 131?145. 39. Holzhauser, H., et al. 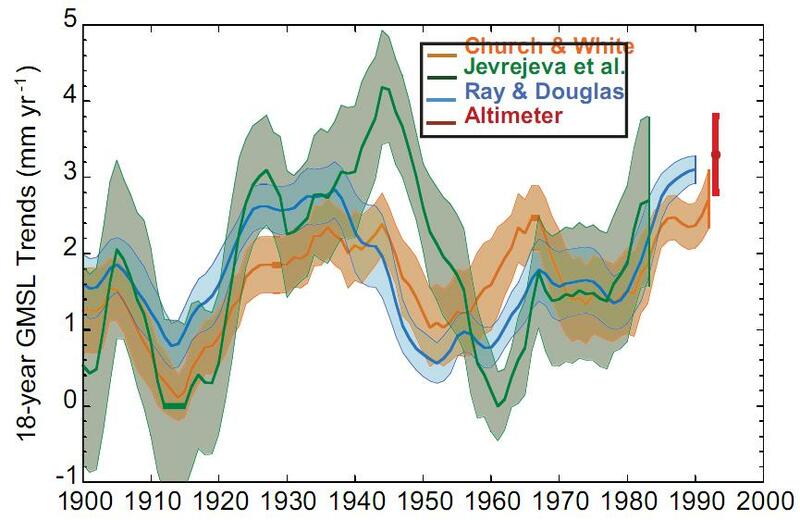 (2005) Glacier and lake-level variations in west?central Europe over the last 3500 years. The Holocene, vol. 15, p. 789-801. 40. Nesje, A., and Dahl, S. (2003) The ‘Little Ice Age’ – only temperature? The Holocene, vol. 13, p. 139?145. 41. Savelle, J. et al. (2000) Holocene Bowhead Whale (Balaena mysticetus) Mortality Patterns in the Canadian Arctic Archipelago. ARCTIC, VOL. 53, p. 414–421. 42. 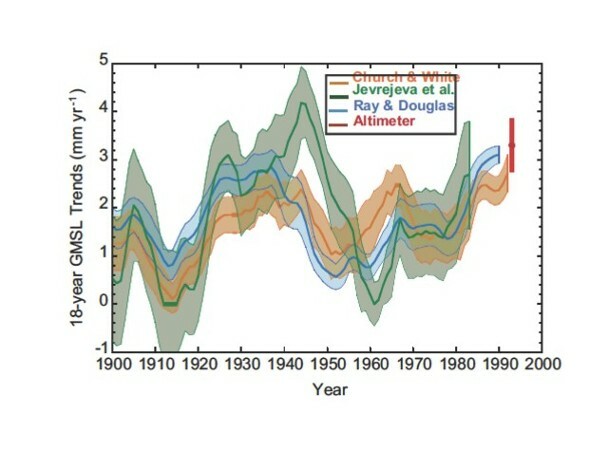 Huss, M., et al., (2009) Strong Alpine glacier melt in the 1940s due to enhanced solar radiation. Geophysical Research Letters, vol. 36, p. 1-5. 43. Huss, M. et al., (2010) 100?year mass changes in the Swiss Alps linked to the Atlantic Multidecadal Oscillation. Geophysical Research Letters, vol. 37, p. 1-5. 44. Chylek, P., et al. (2006) Greenland warming of 1920–1930 and 1995–2005. Geophysical Research Letters, vol. 33, L11707, doi:10.1029/2006GL026510. 45. Polyakov, I., et al. 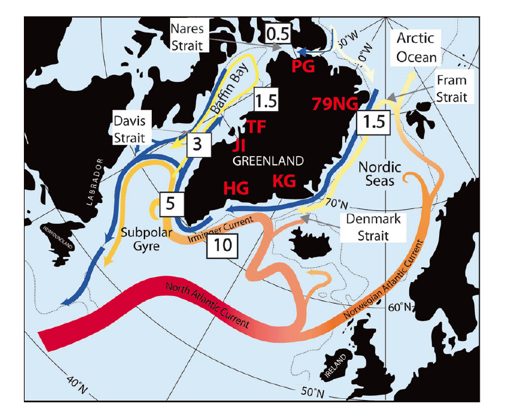 (2011), Fate of early 2000s Arctic warm water pulse, Bull. Am. Meteorol. Soc., vol. 92, p. 561–566, doi:10.1175/2010BAMS2921.1. 46. 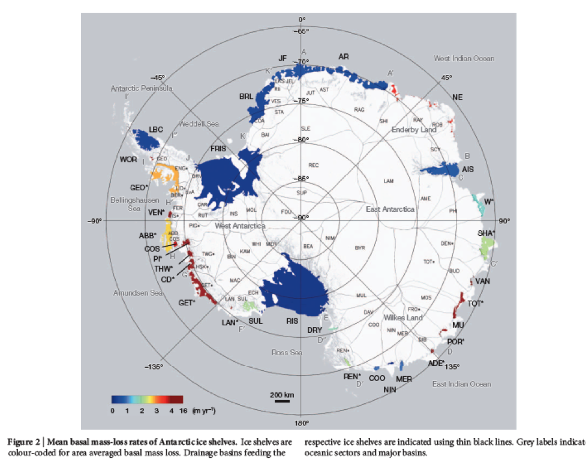 Turner, J. et al (2009) Non-annular atmospheric circulation change induced by stratospheric ozone depletion and its role in the recent increase of Antarctic sea ice extent. GEOPHYSICAL RESEARCH LETTERS, VOL. 36, L08502, doi:10.1029/2009GL037524. 53. Box, J. et al (2009) Greenland Ice Sheet Surface Air Temperature Variability: 1840–2007. Journal of Climate, vol. 22. 54. Menary, M. and Scaife, A. (2014) Naturally forced multidecadal variability of the Atlantic meridional overturning circulation. Climate Dynamics, vol. 42, p.1347–1362. 56. Wanamaker, A. et al (2012) Surface changes in the north Atlantic meridional overturning circulation during the last millennium. Nature Communications, vol. 3. 57. Koshkarova, V. and Koshkarov , A. (2004) Regional Signatures Of Changing Landscape And Climate Of Northern Central Siberia In The Holocene. Russian Geology Geologiya and Geophysics i Geofizika Vol. 45, No. 6, pp. 717-729. 58. 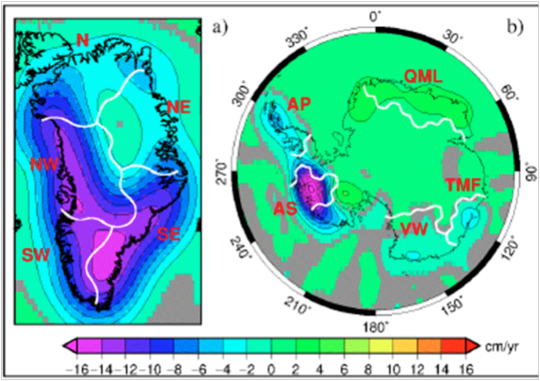 Kaufman, D. et al (2004) Holocene thermal maximum in the western Arctic (0–180_W). Quaternary Science Reviews, vol. 23, p.529–560. 60. Gillett et al (2008), Attribution Of Polar Warming To Human Influence. Nature Geoscience Vol 1. 1. How do we determine if resent ice melt is any different from past natural melting? 2. Why are melting Antarctic glaciers happening in relatively small, restricted local regions? 3. Why were rates of glacier melt greater in the 1930s and 40s? 4. Why is Arctic sea ice melting but Antarctic sea ice expanding to record extents?